“I Want the World to Wake Up”: Hiroshima Survivor Criticizes Obama for Pushing New Nuclear Weapons | Democracy Now! survivor of the U.S. bombing of Hiroshima in 1945. She is an anti-nuclear activist and has worked as a social worker for decades in Toronto, serving Japanese-speaking immigrants. 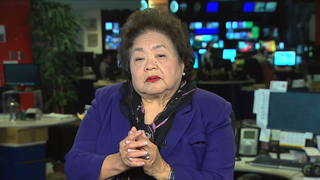 Extended interview with Setsuko Thurlow, who survived the Hiroshima atomic bombing, about the bombing of 1945 and her push to eliminate nuclear weapons. On August 6, 1945, Thurlow was at school in Hiroshima when the U.S. dropped the first atomic bomb on a civilian population. She has been an anti-nuclear activist for decades.